Get our ultra reliable airport taxi service and experience a positive transfer experience from our experienced drivers. We drive passengers between Aldershot, Farnborough, Camberley, Frimley, Frimley Green, Mytchett, Cove, Hawley, Southwood, Farnham, Fleet, Heatherside, Church Crookham, Elvetham, Normandy and Tongham to and from Heathrow, Gatwick, Luton, Stanstead, Southampton and Farnborough airport including Biggin Hill and Blackbushe airports. Whatever is the size of your group, we could provide upto 8 seater MPV. These vehicles are properly checked by the licensing offices and we clean the car for you, presentable and smells good. For enquiries or quotations please fill in our enquiry form. We will reply within 30 minutes. Farnborough Taxis EU offers 'money back if we are late' guarantee taxi service in all of our airport transfer services, it is a VERY STRONG & SERIOUS COMMITMENT that no taxi companies in the areas of Aldershot, Farnborough, Farnham, Ash, Ash Vale commits. Our airport-hotel taxi services are highly competitive, please read our taxi blog for more taxi saving tips. You could find a list of hotels, bed and breakfasts, accomodations and serviced apartments in the hotel listing website we prepared. Farnborough Taxis EU offers reliable airport-hotel taxi transfers from/to local hotels like Aviator Hotel, Village Hotel/De Vere-Farnborough, Holiday Inn-Farnborough, Lakeside Hotel, Potters International Hotel, Max Serviced Apartments, Travelodge, Premire Inn, local guest houses, bed and breakfast and accomodations both in Aldershot and Farnborough areas. Our local taxi service covers Aldershot, Ash, Ash Vale, Farnborough, Frimley, Frimley Green, Farnham, North Camp train station areas. Farnborough Taxis EU have local cabs and private car hire taxicabs that are comfortable and reliable, try our taxi services from and to North Camp Train Station, Farnborough North and Main train stations and the nearby Ash Vale, Aldershot and Ash train stations. Book your local taxis and taxis to/from/in local train stations in plenty of time to avoid missing your train. Farnborough Taxis EU accepts business taxi booking from the local business parks and companies including CSC, Aldershot, Johnson Controls, Aldershot, Autodesk in Farnborough, Agusta Westland in Farnborough, The Hub in Farnborough, Farnborough International Venue Events (FIVE) in Farnborough, British Aerospace, AIIB, Nexus, Frimley, Farnborough, Ash Vale, Southwood, Camberley, Business parks and other local companies included in the local Farnborough business directories and listings. We specialized in chauffeur taxi services within Farnborough including Farnborough Airport and in the famous Farnborough Airshow event. 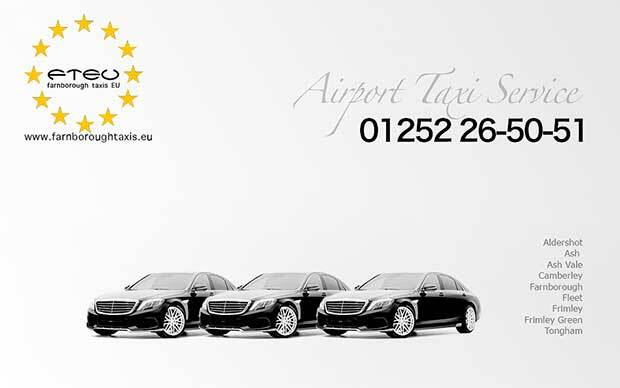 CALL 01252 651669 for any airport transfer service! Experienced a transfer service that left a positive impression on the way they conducted business and taxi service. We were especially impressed by always being able to contact them. Always incredibly responsive, customer oriented, and courteous. I never fail to wait too late to book, but they still find a way to work me in. Recommend to all my friends.